The Activision CEO's public image isn't a fair reflection of what the man is really like, says the Blizzard co-founder. Bobby Kotick is probably one of the least liked people in the videogame industry, at least on forums and message boards. But Blizzard CEO Mike Morhaime has stuck up for Kotick, saying that people give him a much harder time than he deserves. 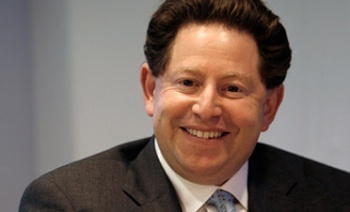 According to Morhaime, the sound bites and comments that gamers latched onto to portray Kotick as a villain weren't an accurate representation of how he actually acted. He said that he had a very good relationship with Kotick, who he said was supportive of Blizzard, and understood what made the studio special. He added that Blizzard would not have supported the merger between Activision and Vivendi Games - Blizzard's parent company - if it had thought that Kotick would have been a bad custodian, or would have threatened its autonomy. Although Morhaime makes a very good point about the fact that there are differences between the public face of Bobby Kotick and what he's really like, it's worth noting that Kotick's relationship with Blizzard is different than his relationship with other studios. As Morhaime says, Blizzard has an enormous amount of autonomy, and thanks to the revenue that World of Warcraft generates, it's quite likely that Kotick needs Blizzard a lot more than Blizzard needs Kotick. That's not to say that Morhaime's comments about Kotick should be ignored, just that the context is slightly different than if the head of Beenox or Treyarch had said the same thing.